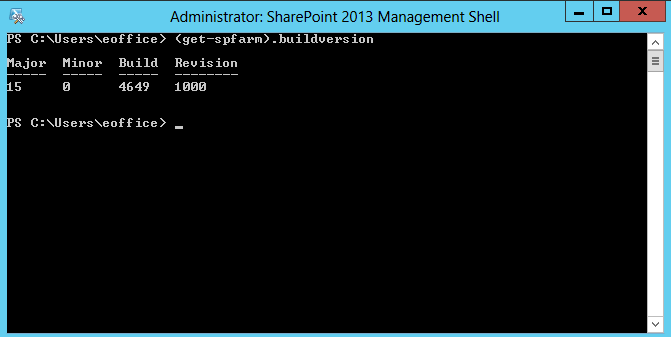 To get the current SharePoint version start the SharePoint 2013 Management Shell and use the (get-spfarm).buildversion command. I really got impressed by reading your blog thus it is really true and very much nice too thanks for sharing these very much appraisal article. this blog is really interesting and very well done. I got a unique information , it is really well done and very much informative too thanks for sharing these valuable information it is helpful for beginners. nice presentation about this blog.each and every words in this articles are useful and helpful to us. It's interesting that many of the bloggers your tips helped to clarify a few things for me as well as giving.. very specific nice content. And tell people specific ways to live their lives.Sometimes you just have to yell at people and give them a good shake to get your point across. We found this 100% Cotton Lucianna Collection Heavyweight Embroidered Decorative Shower Curtains by the brand Home Fashion Designs. I like this blog it is really well good and very much exclusive too. I like this site thank you. This is the best source I have found in a moment. - تعد شركة تركيب اثاث ايكيا من الشركات المفضلة لكثير من العملاء فهم من منحوها الصدارة والتميز لتميز الخدمات المقدمة لهم وهي الاولي في تركيب الاثاث لزيادة خبراتها الكبيرة لسنوات. I just loved your way of presentation. enjoyed reading this .Thanks for sharing and keep writing. It is Obat Gondok Beracun like this. As constantly, we appreciate yourself assurance and accept as true within us.